Breanna Stewart had 22 points, 14 rebounds and five blocks to lead No. 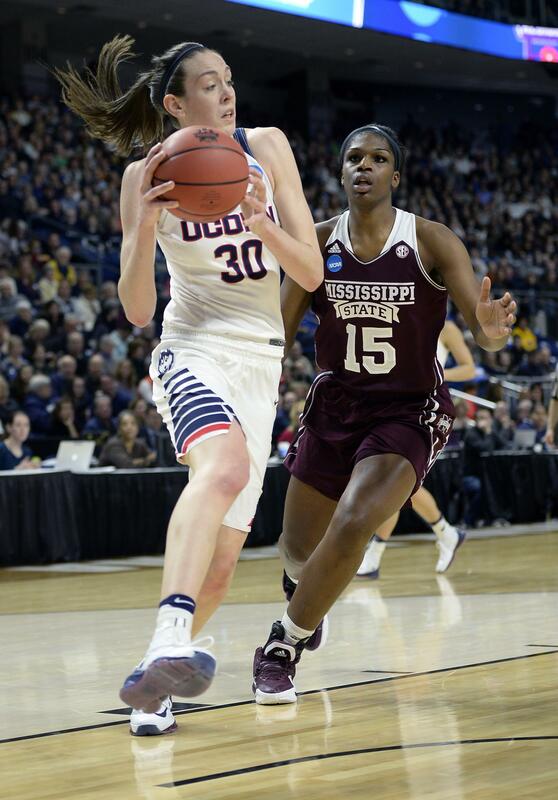 1 UConn to a 98-38 record rout of fifth-seeded Mississippi State on Saturday in Bridgeport, Connecticut. The win was the 72nd straight for UConn (35-0) and left the Huskies three victories shy of an unprecedented fourth consecutive national championship. Their road to that historic title got a bit easier on Friday night when top seeds South Carolina and Notre Dame both lost in the Sweet 16. Stewart and the Huskies were determined to make sure that the upset trend didn’t continue Saturday. The best team in the nation put together one of its most dominant games during this run, needing just four minutes to quash any thoughts of the Bulldogs pulling off the victory. UConn scored the game’s first 13 points and led 32-4 after the first quarter. It didn’t get any better for the Bulldogs, who trailed by 49 at the half and lost by a record margin. Oregon State 83, DePaul 71: Jamie Weisner had career highs with 38 points and seven 3-pointers and the Beavers (31-4) advanced to their first regional final with a victory over the Blue Demons (27-9) in Dallas. Weisner also had 10 rebounds for Pac-12 champion Oregon State, the No. 2 seed in the Dallas Regional. They will play top-seeded Baylor on Monday night with a Final Four berth on the line. Sydney Wiese added 13 points for Oregon State, including three 3-pointers in an early 3-minute span when the Beavers went ahead to stay. Ruth Hamblin also scored 13 points. DePaul was in its fourth Sweet 16 under 30-year coach Doug Bruno but has never advanced further in the tournament. Jessica January had 20 points for DePaul and Jacqui Grant had 15. Texas 72, UCLA 64: Imani Boyette scored 18 points and grabbed 10 rebounds to lead the second-seeded Longhorns (31-4) to a come-from-behind win over the Bruins (26-9) in Bridgeport, Connecticut. Brooke McCarty added 15 points for Texas, which will play in their first regional final since 2003. But Texas scored the first 10 points of the fourth to take a 58-54 lead, and did not trail again. Texas will play UConn in the regional final. Baylor 78, Florida State 58: Nina Davis scored 30 points and the Lady Bears (36-1) are going to the Elite Eight for the third straight year after a 78-58 victory over Seminoles (25-8) in Dallas. Baylor, the No. 1 seed in the Dallas Regional, went ahead to stay with a 15-3 run to end the first quarter after an early flurry of turnovers led to frustrated coach Kim Mulkey calling timeout. Alexis Jones added 15 points, nine rebounds and five assists for Baylor, which has a 23-game winning streak. Khadijiah Cave had 10 rebounds. Leticia Romero had 11 points for fifth-seeded Florida State, which made consecutive Sweet 16 appearances for the first time in school history. Ivey Slaughter and Shakayla Thomas each had 10 points. Published: March 26, 2016, 11:28 p.m.